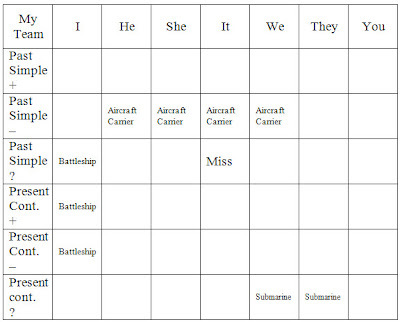 War Ships is the mother of all grid games and great for review and revision in the TEFL classroom. I often play this game with my students in the last class of the semester. More than most TEFL games, War Ships requires a very thorough explanation of the rules before proceeding. If there is some confusion, go slowly and repeat using slightly different language. For this game, you will need a game sheet for each student. You can download the sheet at the bottom of this blog post. The game sheet described in this post uses past simple and present continuous verb tenses. However, you can use this game with any verb tense or grammar point. Download the generic game sheet at the bottom of this post and fill in the categories according to your plan. This game usually takes approximately 90 minutes to play, which includes explaining the rules to your students. While this may seem like a fair amount of time to invest toward playing a game, it is well worth it. I can almost guarantee universal participation and a great atmosphere in the classroom when you play this game. With a smaller class whose English is quite good, I have explained all the rules and played one game in as short as 45 minutes. Because the game is partly based on chance, it is hard to predict exactly how long each game will take. Better to give yourself more time than you may need. You can always play another round if there is time left. Nothing more frustrating for your students than for the class to finish before a winner is declared. Explaining this game to students and getting everything set up can take 20 minutes or more. However, it is well worth taking the time to ensure maximum understanding and benefit is gained. First, hand out a sheet with the following vocabulary: shoot, hit, miss, sink, aircraft carrier, battleship, submarine. You can download a sheet with the vocabulary at the bottom of this blog post or you can go over the information on the whiteboard in your classroom. Next, draw a simple table on the whiteboard and label the top row 1, 2, 3, 4, 5, and the left column a, b, c, d, e. Then, draw an x in any of the quadrants that appear in the table that you have drawn. Ask a student where the x is located. It may take a bit of prompting, but you should be able to elicit the correct response (a, 4 or 4, a, or whatever the correct answer may be). Draw a few more exes in various locations in the table and get some of the other students to answer. Make sure all students are clear on this before proceeding. 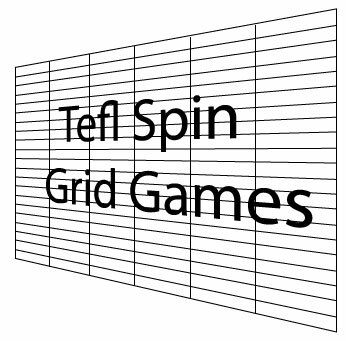 Then, draw an exact replica on the whiteboard (see image further down) of the grid that you will use when playing the game. Point out that along the top row of the grid are the seven subject pronouns. Along the left-most column of the grid are the verb tense categories—you have Past Simple Positive, Past Simple Negative, and Past Simple Question, and the same positive, negative, and question categories for present continuous. Now, point to one of the squares in the grid and demonstrate which verb tense category and subject pronoun it represents. If the square represents Past Simple Positive, with the pronoun "I," a team would "shoot" at that square by making a sentence such as "I went to the mall yesterday." Next, on the whiteboard draw 3 rectangles next to the grid. Label the smallest rectangle "submarine = 2 squares," the next rectangle "battleship = 3 squares," and the longest rectangle "aircraft carrier = 4 squares." Point to the submarine rectangle and then draw a "submarine" that occupies 2 squares on the grid. To keep the game simpler, I recommend allowing the teams to only draw the ships vertically and horizontally and not diagonally. Now, go over the concept of "shooting" by forming the relevant sentences again. Provide an example for a square near the submarine that you have drawn on the grid. Indicate that this shot would be a "miss" (see image below). Choose a student in the class and have her "shoot" at one of the squares over which the submarine is drawn. Indicate that this is a "hit." Next, separate the class into two teams and hand out the game sheets. Make it clear to the students that the top grid is where they must draw their ships, and the bottom grid is where they record their "shots" at the other team. Give the teams a few minutes together to decide where they want to draw their ships. All the members of the same team must draw their ships in the same location on their game sheets! It is worth having a look at all the students' game sheets to make sure that no one has incorrectly drawn their ships in a different location than their teammates. It is also very important that all members of both teams record their shots at the other team on the bottom grid (grid labeled "Enemy Team"), and their opponents shots at them on the top grid (grid labeled "My Team"). The teams should sit in a row facing each other. Team 1 begins with one member of the team briefly consulting with her teammates and deciding where they want to "shoot." Based on the square on the bottom grid where they want to shoot, the student then speaks out the statement or question. Because the other team may not be able to quickly decipher exactly what the category of the question was, you (the teacher) can summarize. For example, "past simple, negative, pronoun 'she.' " You can also point to the relevant square on the grid that you should still have on the whiteboard. After a student "shoots," the opposing team responds by saying "hit" or "miss." The team will respond "sink" if a particular ship has been hit the required number of times (submarine is sunk by 2 hits, battleship 3 hits and aircraft carrier 4 hits). Then, team 2 shoots. Go back and forth in this manner with all students taking turns at making sentences and responding (as the excitement level rises, the teams will be shouting in unison "hit" or "miss"). I advise that you keep a close eye on both teams and their game sheets and make sure that all students are accurately recording their hits and misses on the bottom grid as well as the hits and misses of the other team on the top grid. It is easy for them to make a mistake in this regard—either by recording the hit or miss in the wrong square or recording the shots on the incorrect grid. Nothing derails this game faster than a dispute over a previous shot and whether it was a hit or miss. Continue playing until one team has sunk all the ships of the opposing team. This is probably the most consistently effective and rewarding TEFL game that I play with my students. When students are eager to speak in English and forget about the usual stress and worry that goes along with it, you know that you have found a successful game. Download the following game sheets and vocabulary sheet for use with the above game. What level is this for?